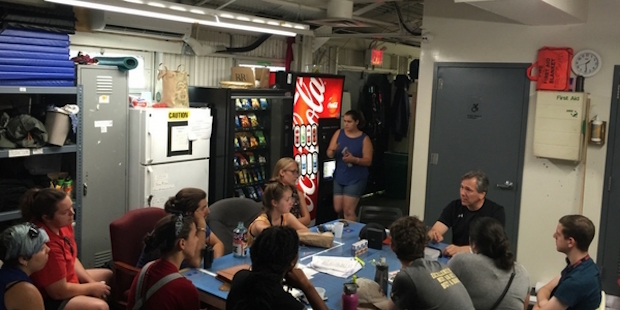 Read more about Ryan's fascinating internship at the Public Theater. If you missed Part 1, you can find it here. Alongside Troilus and Cressida, I had an amazing opportunity to work on a second show which was also showing at the Public during my internship. This show was called Privacy and one of the most interesting aspects of this show was that it had originally been developed in London and then transferred to New York, so the creative team were British and we were all adapting to the American system together. Privacy was also a brand new play so the writer and director were changing the plot every day, offering an exclusive look into the vast changes productions make before they finally open to the public. On Privacy, I was able to work with and learn from the technical departments. Fortunately, Privacy was a technology-heavy show so there was a lot to experience. With lighting, sound and video all working together throughout the process, it was incredible to see how advances in technology had been embraced and incorporated into the production. The play itself also offered a unique learning opportunity as it’s concept was quite revolutionary in that the audience were able to influence the plot at every performance, meaning that no two shows were the same. As a member of staff, I was invited to the opening night of Privacy which gave me a great opportunity to network with a range of people from the industry, both UK and US based, and I believe that one of the greatest things you can take from any internship is the contacts which you make. Working on any production allows you to create a second family and I hope my Public Theater family will stay with me throughout my career. Aside from working on productions, the internship also included opportunities to meet with and interview various industry professionals. This gave us a chance to find out about their stories and how they got where they are today. It also gave them the chance to meet us so that they had a knowledge of who we were and what our background was. I had the opportunity to talk to LaTanya Richardson, wife of Samuel L. Jackson, as she was one of the actresses at the Central Park theatre. She talked openly with us about her journey, her life and her career. She offered us advice about how to succeed and how to deal with difficulties associated with our industry. It was great to get a performer’s perspective of the industry because in my training, I had mostly come into contact with production crews. I also met with Rick Sordelet who was the fight director on Troilus and Cressida and has worked on many Broadway shows including all of the Disney Theatrical productions. It was an incredible opportunity to meet Rick and to see him work on a daily basis. He showed a strong interest in each of the interns and what they wanted to achieve in their careers, and provided each intern with guidance regarding how they could succeed and steps which they could take to further their careers. Rick has a wealth of experience in the industry and has also worked as a writer and director, so it was amazing to speak with him alongside learning. One of the great things about interning at a theatre in New York City is that you’re close to so many other great theatres and a wide variety of shows. Through my internship I had the opportunity to tour some of these theatres and talk to the production staff working on their shows. 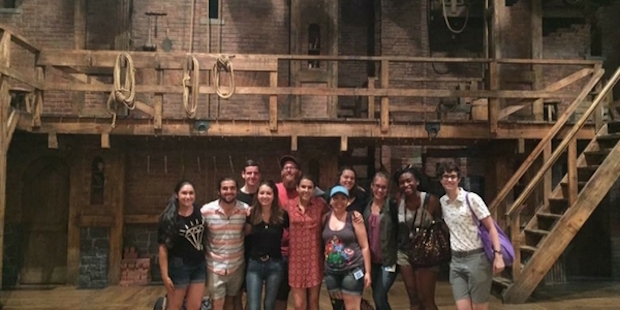 I had an amazing opportunity to tour Hamilton: An American Musical at the Richard Rogers Theatre as this show started life at The Public Theater and we were able to meet the Assistant Stage Manager who had been with the show from the very beginning. I also had the opportunity to tour Wicked at the Gershwin Theatre and was able to meet one of the Stage Managers on this show who told us about her responsibilities and how the show is run. While in New York I wanted to experience as much theatre as possible and during my time in the city I had the chance to see a wide range of shows. This really allowed me experience the theatre culture of both Broadway and Off-Broadway shows and I tried to see a range of shows including straight plays, musicals and variety performances to get a better sense of the styles of performance which are popular in New York. When I wasn’t interning at the theatre, I wanted to absorb as much American culture as I could, while also trying to learn more about their history. New York was an ideal location for this as there are an endless supply of fascinating museums and exhibitions. 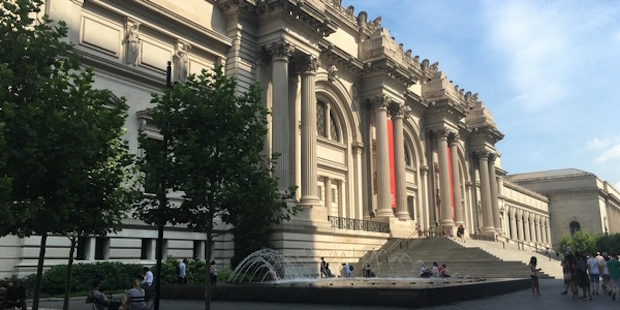 I visited The American Museum of Natural History, The Metropolitan Museum of Art, The Guggenheim Museum, The Intrepid Sea, Air and Space Museum and Central Park Zoo. All of these attractions gave me a wealth of knowledge about American culture and also cultures from across the world. These museums are constantly updated with amazing pieces and I found that I was learning a lot without even trying. In homage to my theatrical interests I also took the opportunity to attend the final match of the Broadway Softball League which sees cast and crew members from Broadway shows competing against each other in softball games which anyone can watch. It was great to see performers and production teams playing together and bonding with the teams from other shows. Doing this internship with The Public Theater has been a once-in-a-lifetime opportunity which I will never forget. I have been able to transfer what I was taught at university into a professional environment and I was able to do this alongside other students and industry professionals. I also had a unique opportunity to work behind-the-scenes on two full-scale New York productions. I was able to make contacts in the industry and get a hands-on experience working on a professional production, in the city where theatre lives. But the best part of this internship has to be the great people I got to meet. Going to New York for the first time was a daunting prospect, but I was immediately welcomed into the group and met friends who I hope I will have forever. Working alongside American students meant that we could all learn together, and could share what we already knew in order to teach each other. Everyone from The Public Theater was extremely helpful throughout my time in the USA and I will keep the memories of this trip forever! Check out our website to see how you can have an experience like Ryan's! 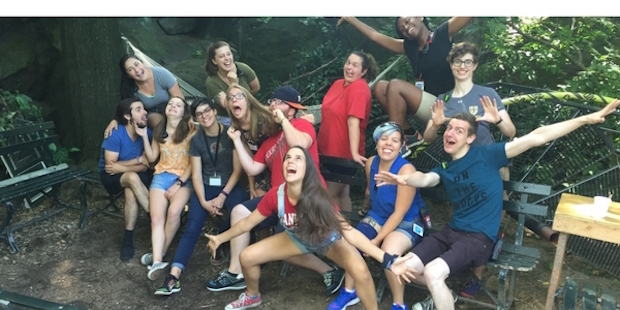 Ryan Van Delden is a participant on InterExchange's Intern USA program doing an internship with The Public Theater in New York City.